I need to say I love the Australian flag. 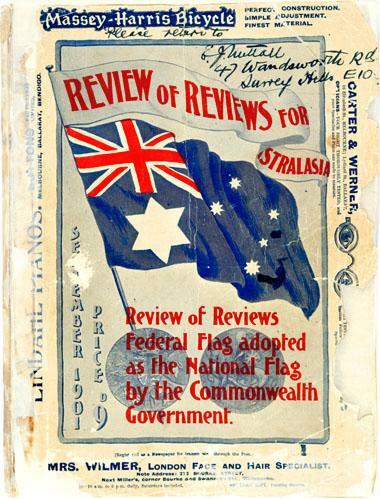 I grew up with this flag as have all Australians since Federation, give or take a few points on the stars. I grew up as an anglo-saxon with strong connection to the United Kingdom. Indeed, living in France for ten years led me to a profound understanding of what it is to have this connection. Our language, our institutions, our dress, our architecture, our food, our ABC (aka BBC, ha ha), our media and its newspapers, the ugly thick mugs we drink tea out of around the country in universities, schools, city offices, workshops, farms, mines come from England and our mood and temperament does too. Yes, of course we are wonderfully multicultural too, full of Asians, Africans, and Indians —and I married a Sri Lankan — but I don’t know if you have noticed, so is everywhere else in the world, England included !! And I love all of that too. However, I resent the obsession, starting with the Bulletin one hundred years ago through to Jonathan Green and guests this very day from six o’clock this morning on their ABC, banging on about the flag, republicanism, mocking the new year’s honours — no mention of leftist barristers scrambling back to QC status — the monarchy, and somehow wanting to continue their adolescent hissy-fit about Australia needing to grow up and becoming more independent and confident when we already have and already are. A few years ago, I went out and bought an Australian flag cooking apron in protest against the obnoxious decision by the Waverley council not to fly the Australian flag over the Bondi Pavillion in case it made certain people feel unwelcome. All I want to say is get over it. Jonathan Green, get over it. The ABC get over it. The ALP, get over it. Be proud of our heritage, be proud of our flag. Perhaps you might all prefer to learn to speak Esperanto. Have a Happy Australia Day. Yet another clarification concerning the Islamisation of the West has developed in the recent “backlash” — yes, at last — with protests in Germany and Denmark in the wake of the Charlie Hebdo assassinations. We might call it the ‘long feared backlash’ announced and dreaded by the sensitive “i’ll ride with you hashtag” Left and the ABC who announced their fear of the rise of the European right as being a more dnagerous than plain good old Islamic fascist murder. This backlash of anti-immigration protesters, who call themselves PEGIDA (Patriotic Europeans Against the Islamization of the West) in Germany, apparently claimed simply that they wanted protection for German culture, and felt that asylum-seekers from Muslim regions were abusing Germany’s welcoming policies toward refugees. The censorious commentators piled in. Really? This is after the West has clamped down on free speech and where the media dare not utter a single truth, the truth that is standing in front of us in plain sight. In Aarhus in Denmark, where a similar protest took place, it was met with a predictably violent attack from the Left in the name, of course, of tolerance and diversity. The anti-Islamic rally started with a moment of silence for the seven people killed by an al-Qaida-inspired gunman in France. Both demonstrations were peaceful until a group of black-clad, mask-wearing youth from the counter-demonstration tried to break through police lines, but officers in riot gear held them back. After the rally finished, protesters hurled rocks and bottles at a bus carrying the far-right sympathizers as police vans escorted it out of the city center. The violent Left always reminds me of the excellent book by Nick Cohen I reviewed several years ago concerning the Left’s love affair with fascistic Islam. So, is there not a clear choice: to shut up and say nothing, or speak up and be accused, incorrectly, of bigotry. Where is the balance? Up until now, adding to the frustration and backlash, has been of course the obsequious nonsense about Islam being only a religion of peace that all our leaders sing out in unison, or perhaps Renaissance polyphony, at each and every atrocity. It is this dhimmitude and cowering that has produced the frustrated backlash, not the standing up to it. Surely the claims of the protesters are understandable. It has been exactly what has been on the minds of most people in Western democracies for several years now and of course it is building. The hardening of the voices against unreasonable demands on Western culture, whether through creeping sharia, the failure of so many to integrate, or the many international surveys showing persistent retrograde and intollerant anti democratic values held by often a majority of our new immigrants, can only get louder. And the sooner the better. This can only be healthy for debate. Posted in Uncategorized | Comments Off on Dreaded backlash ?? ” The European Union, with 503 million people, has seven per cent of the world’s population, yet spends 50 per cent of global welfare expenditure”. An extraordinary and very worrying summary of the tensions arising in Europe is put forward clearly and concisely by Paul Sheehan in the SMH. He gives a compelling list of problems which, when put together, looks very much like a slow motion train crash. The year that started with a massacre in Paris, followed by deadly combat between Islamists and police in France and Belgium, is going to deliver a rolling salvo of shocks for the great experiment of European unification. Posted in economics, politics | Comments Off on Is Europe falling apart? fallible, twisted or circular resaoning that when dissected is wrong, does not make sense or does not explain the situation rationally. The murders today in Paris are not a result of France’s failure to assimilate two generations of Muslim immigrants from its former colonies. They’re not about French military action against the Islamic State in the Middle East, or the American invasion of Iraq before that. They’re not part of some general wave of nihilistic violence in the economically depressed, socially atomized, morally hollow West—the Paris version of Newtown or Oslo. Least of all should they be “understood” as reactions to disrespect for religion on the part of irresponsible cartoonists. But the murders in Paris were so specific and so brazen as to make their meaning quite clear. The cartoonists died for an idea. The killers are soldiers in a war against freedom of thought and speech, against tolerance, pluralism, and the right to offend—against everything decent in a democratic society. So we must all try to be Charlie, not just today but every day. Are we really all Charlie? Following the horrific events in Paris there has been a massive amount of commentary on the West and its continual appeasement of Islam. There is much agreement that the Western media, our politicians and the Left commentariat are in a continual state of dhimmitude, starting with the White House which issued a statement that the attacks in Paris on Charlie Hebdo were not Islamic followed by the obligatory “Islam is a religion of peace”. These events clarify just how political correctness and timidity over the years has got us into this mess. Remarkably, a few months ago, Tony Abbott performed an incomprehensible back-down on his promise to scrap our anti-freedom of speech laws just at a time when our freedoms to express honestly held opinions are most under attack. This muzzling encourages precisely the very extremism that the political elites deplore and against which they all vainly protest. Just as fear spreads, Henderson also calls out the stupidity of journalists who are more worried about the growth of right wing parties in Europe rather than the Muslim extremists with the Kalashnikovs who actually brutally kill citizens. … on ABC radio’s The World Today, Australian-born journalist Annette Young, described a possible growth in support for the National Front, and its leader Marine Le Pen, as the “big worry” following the attack on Charlie Hebdo. You are still continuing to self-censor because you have not published or republished cartoons of the Prophet Muhammad. You have not honoured Charlie Hebdo the way they need to be honoured, which is they took a risk, they took a risk to stand up for the core values of Western civilisation. And you, the media, are letting them down. You have drawn and published caricatures of the terrorists, but you have not published caricatures of the Prophet Muhammad. Tragically, many in the West, including those who call themselves liberal, had forgotten the importance of free speech, and the benefits of blasphemy itself, long before this week’s horrific assault. Across Europe over the past 30 years offensiveness has been turned into a crime. In every European country, hate-speech laws have been introduced to control and punish the expression of certain beliefs. …It’s just that where politicians think offensiveness is only an imprisonable offence, theCharlie Hebdo killers think it deserves capital punishment. So the barbarism in Paris has not taken place in a vacuum. It occurred on a continent where anti-offensiveness is written into law and stamped into many campaigners’ hearts, and where liberals all too often side with the offence-takers over the offence-givers, the speakers or writers who have uttered the unutterable. Incandescent with rage and frustration is MARK STEYN about useful idiots like President Hollande — and like President Obama and British PM Cameron — who claimed against all the evidence that “those who committed these terrorist acts have nothing to do with the Muslim religion”. They tested the foe again this week: They assassinated the senior editorial team of the only publication not willing to sign on to the official “No Islam to see here” line. And they were rewarded for their slaughter with the président de la république standing up in public insisting there’s “No Islam to see here. The West’s political leaders have already told Muslim leaders they agree that mocking Islam is a sin, and have even passed laws — in France, too — making it unlawful. They have attacked the very few journalists and politicians who dared warn against the Islamist threat. Anything for peace, even if it means submission. And for all the protests this past week, submission is what you must expect. The reality is that there is a problem with Islam. To say that is not to deny Islam’s immense diversity, impugn the millions of Muslims who abhor the horrors being wreaked in their name, or dispute the enduring value of religious faith in a secular age. But it is undeniable that Islam’s distinctive features make it especially vulnerable to being used to incite religiously motivated ­violence. Those features include the glorification of battle, with Mohammed mounting 65 expeditions against unbelievers in his decade-long rule in Medina, and personally commanding nearly half of them; the duty to wage jihad and “terrify the enemies of God”, fighting unbelievers until “the religion is God’s entirely”; the aspiration to impose Sharia law and restore the caliphate, an Islamic concept without parallel in the other Abrahamic religions; and the cult of martyrdom, with Mohammed himself being quoted as longing to be killed in jihad only to be resurrected and then killed fighting again. Cate Blanchett made her self satisfied, self promoting oration at the ABC/ALP funeral extravaganza only a few weeks ago, where on the television screen I swear her nose grew a few centimetres, explaining the extraordinary benefits she had gained by all the free university education she had received through the Whitlam Government — aka Australian taxpayer — largesse. On its heels comes another triumphant self-justificatory explanation of the value of an Arts Degree for our national future, nay, the future of humanity, this time delivered at the North Ryde’s Macquarie University Faculty of Arts. Quite right. What do scientists know about exploration? We all remember arts graduate Neil Armstrong’s thrilling dissertation on lunar inequality and post-modernism during his landmark 1969 moon tutorial. You get the drift. It reminds of my rediscovery only a few years ago of CP Snow’s “The Two Cultures and the Scientific Revolution” that I had studied along with so many others in the early 60’s at school. I very quickly realised in this quote that Snow was talking about the self-indugent narcisistic dreamers of the Left, the culture that disregards and distains wealth creation and industry, a culture with a total ignorance of economics and a culture made up of preachy environmentalists that basically have little understanding of science. Snow understood the difference between the Arts and Science; the moralising and the creating; the seeming and the doing. You are currently browsing the andrewmcintyre.org blog archives for January, 2015.